WONDERING WHY A PLAYER HASN'T BEEN INCLUDED? PLEASE READ THE DISCLAIMERS & REMARKS SECTION FIRST! 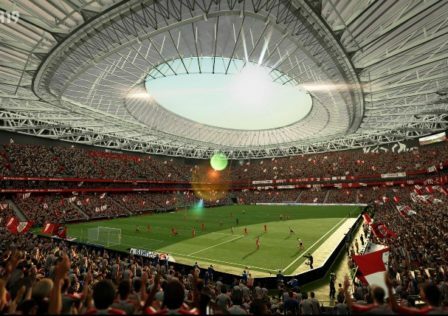 I do not work for EA, hence player picks/ratings/images are not final. This is not who I want in the TOTW, but rather who I think EA will choose. 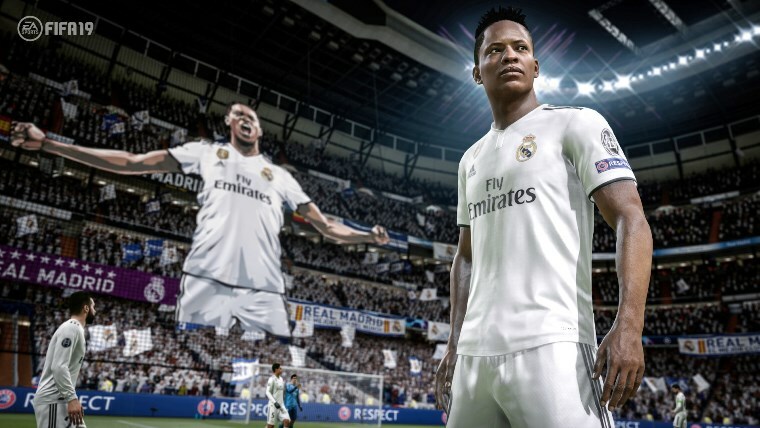 Likewise, there are other, more deserving players who should be in the team, but at times EA doesn't seem to care much about real-life performance (See TOTW 10). There are again a few games left to play on the Monday as well as a few fringe matches Sunday night. In the past few weeks these matches have not been included in the TOTW by EA. Generally Tuesday matches are not considered for the TOTW at all although last week EA chose to. I have once again not considered them this week as the tendency continues to be towards their exclusion. Like EA seem to do, I consider G then A then MOTM awards then match rating in that order when selecting players. No, I don't watch every game. I tried it last week but have since been told I can't sleep at Sky HQ – thus I have not been able to watch that Chilean League match on Thursday. I watch what games I can, but all of my predictions are based off match stats and ratings after the fact. No, I don't hate your team. I've mentioned on here before that I'm a lifelong United supporter. With that being said, I've actually underestimated the number of United IFs this year. I do my best not to be biased and I'm certainly not sat here leaving out players out of some sort of spite. Apologies for the later upload this week – a few technical issues mean that this has taken me just over 8 hours today to put together. 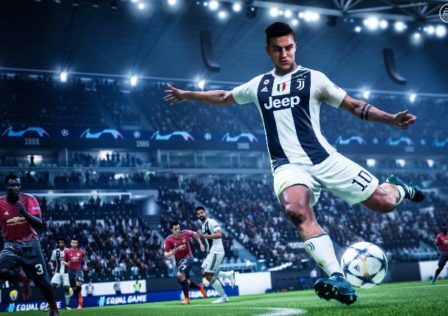 Read: We need a pitch notes on specifically what each attribute does and the affect it has in-game. Sergio Aguero has an IF card currently out and thus is not eligible for another IF card – Raheem Sterling is the next obvious choice. I usually don't include 2 players from the same team (nor do EA) but I've gone for both Pizzi and Ruben Dias from Benfica for their ridiculous 10-0 win. SIF Haris Seferovic is also a possibility at ST with 2G1A. Pablo Sarabia's performance usually wouldn't merit another IF card but given his Headliner's card I think EA will be keen to pump up the rating as much as possible. Either Casemiro or Sergio Ramos could feature for Real Madrid – Sergio Ramos was MOTM but his goal was from the spot and Casemiro would be the more prized card in FIFA given Ramos' recent MOTM. I've gone for Ramos but only just. Likewise either Sami Khedira or Emre Can could feature for Juventus, both in that CM spot. Both had 1G but Can had a higher match rating. Wijnaldum features over Salah as I can't see Salah being awarded a TIF for 1G. Marc-Andre Ter Stegen could also feature as a late candidate on the Sunday. I don't think we'll see both Ter Stegen and Lloris in the same TOTW and as I think Lloris is more deserving, Ter Stegen is left out in favour of Salvatore Sirigu. James Rodriguez only had 1A which normally wouldn't be enough, but I think his card rating combined with his 9.6/10 match rating sees him feature. I'm sure you think I've missed a few players. As long as you're civil about it I'm more than happy to take suggestions/opinions! 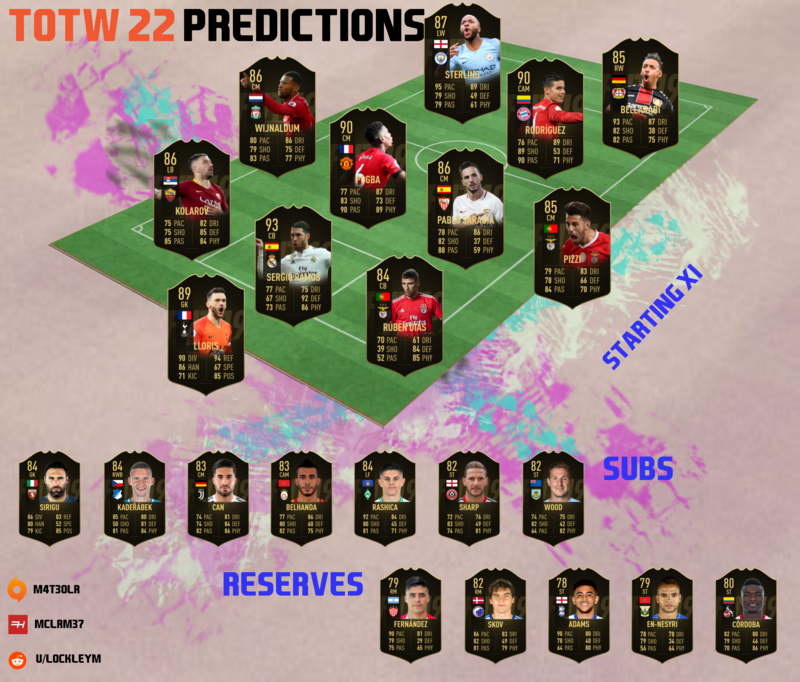 © Post "TOTW 22 Predictions" for game FIFA 19.